One of the big cost centers for sheet metal cutting, profiles, and tubes companies is, of course, raw materials. All improvements to their utilization entail substantial improvements to production margins. Therefore, material utilization is one of Lantek’s priorities and we’ve developed our portfolio around this concept. Our products are designed to maximize the number of parts per ton of material. Would you like to know how? Lantek has been leading the global CAD/CAM market for sheet metal cutting, profiles, and tubes companies for over 30 years. It is no coincidence that over 20,000 customers put their trust in our software for nesting and numerical control. We have the most advanced nesting algorithm in the world, the product of continuous optimization in collaboration with our customers, technology centers, university, and partners. Lantek Expert’s automatic nesting optimizes the availability of sheet metal parts by seeking maximum utilization of parts and scrap. Lantek Expert automatically detects scrap in the warehouse and prioritizes its use before using new sheet metal. The nesting algorithm is so powerful that it can be generated in a single click. However, if you’d like to, you can manually change the pivots, lead-ins, and modifications as you wish. Nevertheless, nesting is just a small part of saving materials. Optimizing the placement of parts and minimizing the space between them is for naught if the sheets or tubes are half-used, and parts that have already been cut and are difficult to use are subsequently accumulated. That is why our next concern is production planning, which is undertaken on our MES. An environment that allows for production orders to be planned by material, thickness, delivery time, and other parameters, allowing for different orders to be connected, saving time, and using the least amount of material possible. In addition to managing the entire production process, our MES offers integration with different inventories, control over machinery in the workshop, and even machinery data collection. All of this information is collected, filtered, and processed to enable you to make decisions that optimize your production system. Because at the end of the process, what makes the difference is your ability, our task is to give you the best possible information for decision making. That’s why in Lantek you can have all the information of each machine, each line or each plant at the moment. Know the real performance (OEE) of yesterday and see its progression in time. Compare material consumption over tons of final parts, analyze different production lines to detect inefficiencies in different resources. And much more. Because in the end technology is the means for you to make the right decisions. 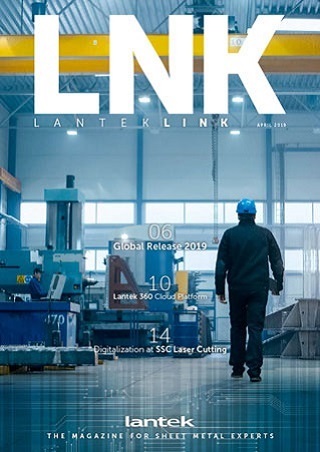 However, in addition to the best nesting, the best production planning in the office and at the workshop, and advanced production process analytics, Lantek offers the latest Augmented Reality to make the most of the remaining scrap. Lantek allows you to directly nest scrap with a touch screen. Our system is able to digitalize scrap with previous cuts, identify the areas available, and allow for any part you wish to cut to be inserted. You only have to select the parts, drag them with your finger to an available area and execute the cut. This is very useful to handle defective parts by making use of any available scrap.